Along with The Dirty Dozen, The ReBirth Brass Band pioneered the progressive New Orleans brass band movement which channeled funky New Orleans parade rhythms, Jazz, Blues, R&B and Pop into an infectious, danceable, joyous music. 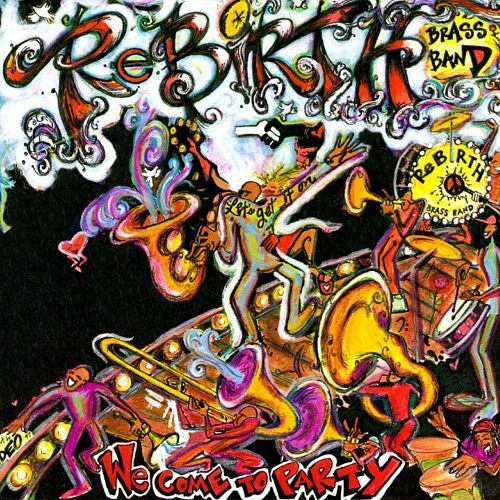 The ReBirth Brass Band has scored regional commercial radio hits in Louisiana, recorded with Aaron Neville, Robbie Robertson and Maceo Parker, and had had two songs on Eddie Murphy's Boomerang soundtrack. We Come To Party captures the wild, energized party music which has delighted audiences at every major Jazz festival in Europe and America. Besides their usual menu of Jazz-Funk originals, there are unique versions of Marvin Gaye's "Let's Get It On," Stevie Wonder's "Don't You Wish" and Michael Jackson's "Liberian Girl". Though rooted in tradition, the music on We Come To Party is as contemporary and fresh as sang street music - Hip Hop, Go-Go, or Funk.